If you visit Europe, I strongly encourage you to visit churches, and stately homes, and to keep your eyes out for the plaques. 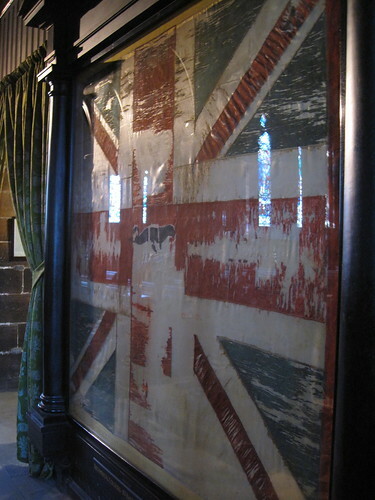 For the battle flags, torn to tatters. For the endless procession of names, each kept in its own place of honor, in the corner of a room, or on a memorial outside the village church. I don’t think that we who have not served can have any sense of how truly devastating war is, and I really don’t think we as Americans can understand how terrible World War I was for Europe. By looking around, though, we can kind of get a sense for things, if we really take the time to contextualize the memorials. Memorials are local, in the UK, in a way that they are not in the US. Here, war cemeteries tend to be where we encounter war memorials, if we encounter them at all. I remember there’s one in Concord CA, but that I only remarked it after we’d returned – it was simply part of the background, before. I believe there’s one on the waterfront in Vallejo, as well. 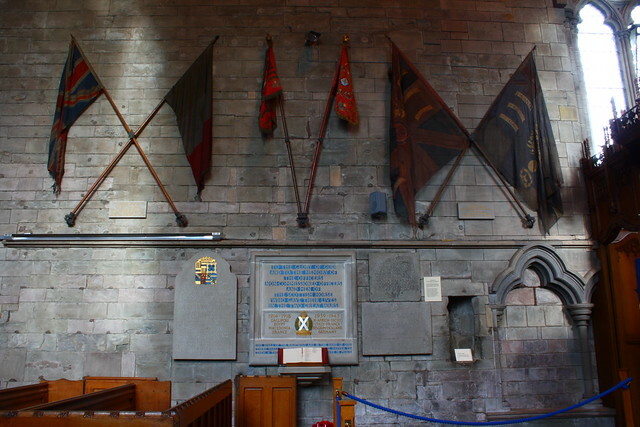 But these are different to Scottish memorials, in that they’re general memorials. “We remember the men of…” sort of thing, and that’s about it. 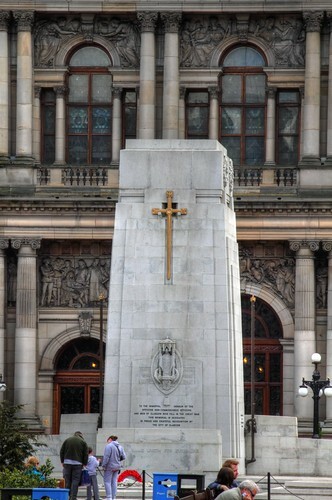 Some memorials are grand, meant to be the centerpiece, such as the one at the center of George’s Square, in Glasgow. 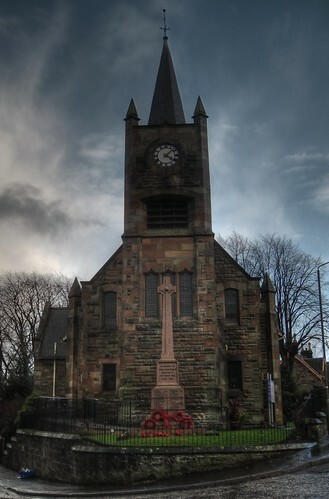 Some stand forth to say, “our village gave dearly,” such as the one in front of the Cambusbarron village church; Cambusbarron was our home village for the last year we were in Scotland, so we got to walk past their monument any time we needed something from the village. Cambusbarron, at the height of its industrial vigor, housed a few thousand people and had a school capacity of 270. 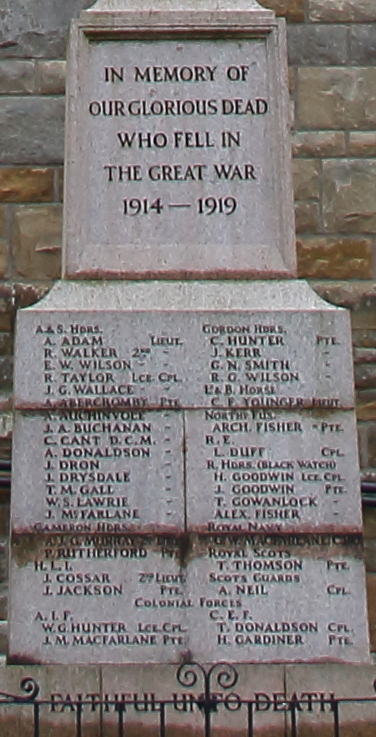 Cambusbarron volunteered 200 men to serve in World War 1, 38 of whom have names on the village memorial, as they (and a few others, unintentionally forgotten) never returned. I don’t think I can really understand living with not only the sheer loss (1/5 of a whole generation of Cambusbarron died). I also don’t think I can possibly understand the trauma of having 1/5 of my generation absent forever, and the remainder of my generation would have seen them die. You see, quite a lot of villages joined up together, and were kept together, particularly in Scotland, where military service is a very … clan-centered activity. You join up with your mates, you join a particular regiment because that’s the regiment your village joins, and you go off to war. And then you spend the rest of your life walking past the ghosts of the dead every day on your way to the market. I remember my father becoming emotional about Veteran’s day, and not understanding why, not being able to conceive of why he – a true 1950’s man, for whom crying just didn’t happen – would be overwhelmed with sadness when the mood would hit him and he’d remember those lost in his own experience of war. From what I know, my father was not sent to Korea because he was in the Air National Guard (which wasn’t deployed). He was a pathologist in the Navy during the Vietnam war or shortly thereafter. But I don’t know why he cried, and it’s now too late to ask. 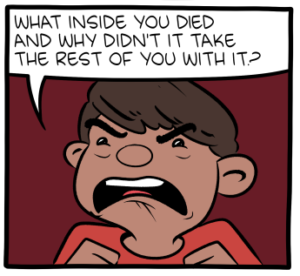 Was it for classmates? There must have been lost classmates, considering my father attended Massanutten Military Academy. I simply do not know. And, of course, it’s not something he spoke of, at least not to me. Veteran’s Day is not a day to celebrate America. It is not a day to celebrate America’s military might. It is not a day to beat the drums of war. Veteran’s Day is a day to remember that war brings death, trauma, and generations of grief.